CONFUSED with all of this......?? 1. Our Inquiry Learning units are written by teachers and educators, for teachers, and are intended to have the hard work already done for you in the planning process. Choice (giving students CHOICE in both depth and complexity is a vital component in differentiating). A SYNTHESIS of TRIED AND TESTED strategies and theories! You'll be amazed and delighted at the simplicity we've created for you! Our inquiry units are based on the idea of differentiated inquiry learning through CONCEPTS. By using a concept to focus a lens on a topic, we open the doors to a wealth of thinking and exploring for our students. 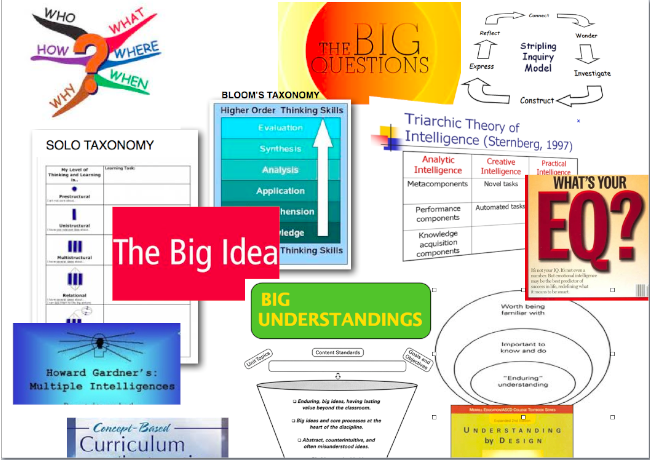 By combining tried-and-tested theories such as Understanding By Design (Wiggins& McTighe, 2005), Inquiry Learning, Renzulli’s School-wide Enrichment model, CPS (Osborn-Parnes problem-solving model for Creative Problem-solving), and also using thinking models and strategies such as Bloom’s, Sternberg’s Triarchic theory, multiple intelligences, learning styles, and more - we hope we bring you a workable and enjoyable DIFFERENTIATED framework for your teaching. Individualising the programme does NOT imply one-to-one teaching. It refers to all the experiences needed to meet a child’s needs, and uses a variety of grouping patterns and classroom management skills. Individualisation can be described as ways of organising learning experiences from students’ assessed achievements and interests, so that these determine the programme (i.e. rate, the content, the schedule, the experiences and depth of exploration) available to all students. Varying degrees of individualisation are possible. Level 1 The teacher assesses each student’s needs, resulting in an individualised level and pace of instruction. Level 2 The instruction becomes more personalised when in addition to individualised level and pace, the student becomes involved in the selection of goals. Level 3 Once levels 1 and 2 have been achieved, the student can begin to incorporate self-directed or independent study skills, as well as the responsibility to self-select learning activities and materials. Level 4 Total individualisation allows teacher and student to co-operatively assess and select goals, learning materials, activities, and instructional techniques. This also allows the student to self-pace, self-level, and self-evaluate, using the teacher as a consultant and resource. - Transfer learning through reflectionBy combining several outstanding models and strategies, we hope to both lighten the teacher’s load and to help you to offer worthwhile learning experiences to your students. Do feel free to distribute copies of this; but do acknowledge the source please! We hope you and your students enjoy! - ready for you to personalise for your class! Using the highly-praised "Inquiry Learning with Concepts" model, this offers you a wealth of meaningful activities to lift your students' learning and to build on students' interests and individual understandings. As H Lynne Erickson says (2007), "Using topics and facts as a support rather than as a final destination, will truly lift academic and teaching standards." Gives you Essential Questions for deep thinking and transfer, such as "How do different types of advertising affect us differently?" and "What happens to the money that is paid for advertising?" PLUS several different assessment tools. All the hard work done for you - provides you with the planning framework, a recommended video link or book as an introductory hook, a set of photocopiable cards to promote sharing of Prior Knowledge...assessments.. even a list of suggested resources! Differentiate by offering your students Choice, Challenge and Complexity - it's all here! What more could you ask for?? Get cracking with these now- get your students deeply involved in Inquiry learning, and save yourself heaps of time planning- all the hard work's been done for you!
" I've used “Rights and Responsibilities”, “Probability” and “Freedom” with Year 3, 4 and 6 GATE groups. I also appreciated the internet links especially the Ted talks. I found some more of ‘my own’ too! Many thanks for all the effort which you have put into creating them and sharing them with us. "